Product weight is 0.75 lbs. 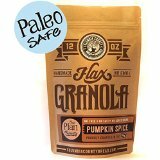 The NEW "Plan"-Friendly Flax-Granola NO added salt NO sugar Oat FREE We set out to create a whole new flax-granola experience - something entirely different from our Fruit & Berry but every bit as Plan Friendly, every ounce as delicious and we did without adding any salt, oats or unnecessary sugars. To do it, we threw out our cranberry base and started all over with a flavorful mix of spices that conjured up the wonderful aroma of walking into a warm home on a cool fall day as cinnamon, nutmeg and cloves filled the air. To that we added a dollop of locally processed Pennsylvania molasses, raw pumpkin seeds, raw sunflower seeds and a scoop of plump raisins.